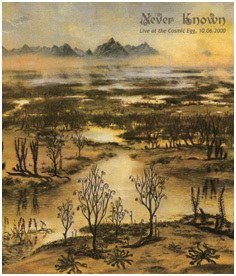 The first edition of Never Known's "Live at the Cosmic Egg, 10.06.2000" was originally published by Centiens, a division of Anaemic Waves Factory, in October 2000 and is sold-out since long time. For this new edition, all tracks were remastered - and sometimes slightly reworked - from the original Dat recording by the author in March 2007 at Lips Vago Digital Studio. The concert was performed at the Cosmic Egg Floatation Center opening party on June the 10th 2000, just a few weeks after "On the Edge of Forever", Never Known's fourth full-lenght album, was released by Eibon Records. On such occasion Andrea Marutti played live renditions of selected numbers from the freshly released album, and also introduced new tracks that are still unreleased in a proper studio version at the moment. Accolgo con estremo piacere l'idea, da parte dell'amico Andrea Marutti, di ripubblicare (uscì già per la misconosciuta Centiens) questo live del 2000, nel quale figurano tracce dallo splendido "On the Edge of Forever" (Eibon) ed altri brani ad oggi ancora inediti. L'amalgama è riuscitissimo, e sebbene io veda sempre con un certo sospetto i live di musica elettronica, si percepisce qui quella componente aleatoria propria dello ‘spettacolo' dal vivo, unita alla certosina precisione che Andrea ripone in ogni cosa che fa', musica compresa. Never Known è da sempre il suo progetto che più apprezzo, dato che sa essere quell'ambient mai troppo cupa (distante quindi dal gemello isolazionista Amon), né mai eccessivamente leggera quanto la già troppo maltrattata new age. Anche in questo disco un equilibrio perfetto di armonia e stemperata tensione, forse qualche suono ‘spacey' di troppo ma l'evolversi lento ed ininterrotto del flusso sonoro è davvero in grado di portare la mente in territori sconosciuti. Per chiunque (come me) abbia già consumato i due dischi di Never Known su Eibon e "Once in a Lifetime" (tra l'atro anch'esso rimasterizzato e ripubblicato in questi giorni), è un disco da avere. Per chiunque non disprezzi l'ambient in toto ed ancora non lo conosca, sempre un disco da avere. "Live at The Cosmic Egg" is a live performance officially released on CDs (Next to "Live at Molto" and "Live in Due Acque" which were performed around the same period). It has been recently re-issued by Afe Records. It remains an important document to appreciating Andrea Marutti's ability to create achieved soundscaping improvisations built on an arsenal of various electronic effects and keyboards. "Live at The Cosmic Egg" is a fascinating listening experience that takes the listener into a rich spacious environment that articulates the properties of sound movements, of duration and ambient aestheticism. It introduces us into a ravishing, ecstatic world of sounds, natural amplified noises that justify a mystical journey through the unknown. It opens with the fundamental composition "Promenade" then it carries on as a spiritual-mindscaping electronic piece called "Spheres". It features long spacey synthesized lines punctuated by various micro-sounds and electronic scintillations. The music doesn't deliver bleak or desolate ambiences, it's pure cosmic electronics with an enthusiastic feel concomitant to aesthetically religious dimensions. This astral-dreamy like voyage carries on sweet sonic soundscapes, suspenseful drones mixed with haunted electronic transmissions. It evocates the schematic division between equilibrium- foundation and energy-transformation. Some pieces feature sound materials taken from last studio releases ("On the Edge of Forever", etc). A real imaginative live performance that tries to extract the best from the spacious context. It experiences music as a "noumenon" or music as a ritualized activity.